Building Inspection Division (BID) is responsible for inspecting the construction of all new and existing buildings and structures for conformity with approved plans and permits, and for compliance with state and local building code requirements. BID responds to emergency situations and complaints of unsafe structures, work without permit, and prepares Notices of Violation as necessary. Unabated cases are referred to Code Enforcement for Director’s Hearings and further action. 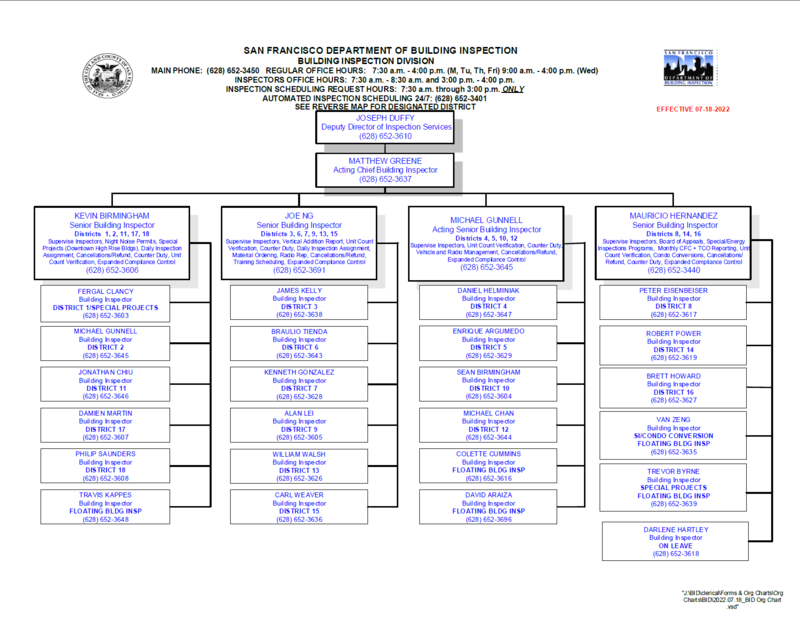 This division also conducts inspections for Police and Fire permits issued by those agencies and issues Noise Permits for construction work at night as prescribed in the in the San Francisco Police Code. Code Enforcement Section (CES) investigates complaints of violations of the Building, Plumbing and Electrical Codes and employs abatement procedures to correct code deficiencies. This section also initiates follow-up enforcement when cases have been referred by other divisions within DBI by holding Director’s Hearings and referring cases to the City Attorney for litigation. Assessment fees are collected from building owners that have code violations in order to recover costs incurred by investigations. The section also assists in the preparation and issuance of Emergency Orders for imminent hazards arising from natural disasters and emergencies. Condo Conversion (CC) program processes requests and performs inspections for condominium conversion in residential and commercial buildings. Disable Access Services (DAS) receives and processes accessibility complaints and answers California Building Code (CBC) questions related to accessibility. It also coordinates the Access appeals Commission (ACC) and issues regarding the American with Disability Act (ADA). Special Inspection (SI) processes and reviews Special Inspection reports and monitors Special Inspection field work. Unreinforced Masonry Building (UMB) program monitors and inspects UMB seismic upgrades.